September of 2018, iFlytek, a Chinese technology company and world leader in A.I. — particularly in voice recognition software — was accused of disguising human translation as machine translation during a tech conference in Shanghai. The whistleblower was an interpreter, Bell Wang, who was doing live translation at the conference. He noticed that iFlytek was using his translations as live subtitles on a screen next to the company’s brand logo. This gave the appearance that the translated output was produced by their A.I. system, rather than by Wang. The company was also broadcasting the translations live online using a computer-synthesized voice, instead of the original human interpreters’ voices. Wang took pictures and videos as evidence. Then, he posted them to Zhihu, a Chinese blogging platform, and accused iFlytek of fraud. This led to a media frenzy and debate over the iFlytek’s PR and marketing tactics. The company claimed to have developed cutting-edge technology — but Wang’s report threw all that into question. You may not have heard of iFlytek. In 2017, MIT Technology Review named itthe world’s “sixth-smartest company” — the highest ranked company from China, just after Google but higher than Intel (13th), Apple (16th), and Facebook (23rd). Microsoft was ranked 27th. It’s listed on the Shenzhen Stock Exchange. At its peak, iFlytek had a market capitalization of US$12–13 billion. It controls more than 70 percent of China’s voice recognition market. At best, the September 2018 incident was an unfortunate accident. At worst, iFlytek was deliberately misleading the public about the quality of its A.I. translation technology in exchange for positive PR and a higher stock price. While lauded A.I. technologies are not fake, they may be less “artificial” than Silicon Valley wants us to believe. If the latter is true, one might easily claim this is an isolated practice — one Chinese company trying to generate good publicity by allegedly counterfeiting A.I. However, a closer look at the PR efforts by other leaders in A.I. — particularly Microsoft and Google — reveals a similar trend. While lauded A.I. technologies like Google’s search algorithm and AlphaGo are not fake, they may be less “artificial” than Silicon Valley’s PR machine wants us to believe. 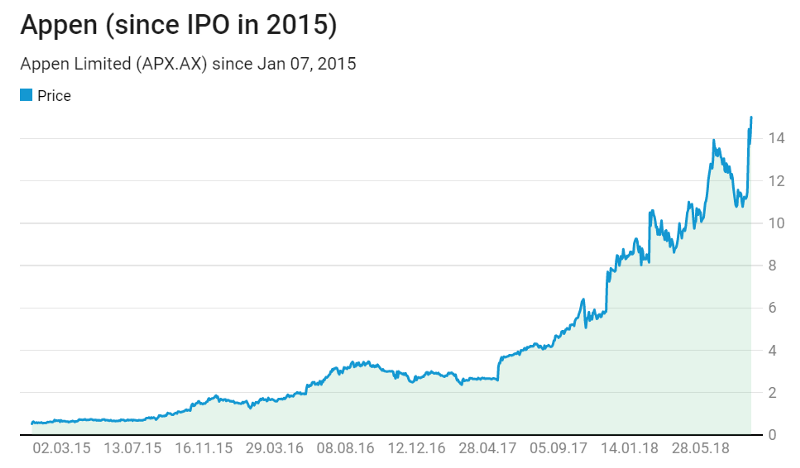 Appen, a little-known publicly-traded company from Australia, is worth $1.57 billion Australian dollars (Bloomberg as of January 15, 2019). For the last four years, this company has been riding the A.I. wave, with revenues and profits shooting up at record rates. The company’s stock price has increased by about 2900 percent (or 29x) since it debuted in January 2015. What does this superstar company do? It provides A.I. companies with input data and results validation: manual checks and balances to ensure algorithms do the jobs they were designed to do. One report said that Appen counts, among its clients, eight of the top 10 tech giants including Apple, Facebook, Google, and Microsoft. The results validation business accounts for 86 percent of Appen’s revenue.¹ According to its website, the company has over 500 full-time staff and more than one million freelancers across the world. These freelancers manually validate search engine results based on set criteria. As a result, these search engines’ output improves. Appen is bound by non-disclosure agreements regarding the names of its clients, but industry experts assume that their largest are Microsoft’s Bing and Google. Collectively, these two companies likely account for roughly one third of Appen’s revenue. In other words, Google and Bing’s search results are manually aided, corrected, and trained by over one million human beings. This distributed labor force is responsible for the reliability and integrity of the searches we conduct every day. If I were Microsoft or Google, I wouldn’t publicize my relationship with Appen either. Tech companies benefit from the perception that they’ve built sophisticated automation and A.I., rather than a system that relies on manual labor. AlphaGo Is Not the Holy Grail of A.I. Perceptions are important. Google, in particular, has appeared to be innovating at a drastic rate in the last few years. AlphaGo beat world champion Lee Sedol in the ancient game of Go in March 2016. Since that win, Google Deepmind’s co-founder, Demis Hassabi, has been calling AlphaGo the “Holy Grail of A.I. research.” This gives the false perception that DeepMind has cracked the ultimate challenge in A.I. However, this is simply not true. The pinnacle of A.I. research is to develop “general A.I.,” a system that can learn skills and knowledge from scratch, just like humans do from childhood. Right now, one of the most challenging aspects of A.I. is Natural Language Processing (NLP): building chatbots and machine translation capabilities that mimic human speech. Writing creatively and understanding contextual language (like jokes and slang) are especially difficult for machines. Julian Schrittwieser, right, commenting on netizens referring to AlphaGo as a ‘he’ or ‘she’ like a person. Source: AlphaGo the documentary. …the A.I.s performed very poorly if the testing set differed from the training set, even when the variance was minor. Ultimately, the team’s A.I. IQ test shows that even some of today’s most advanced A.I.s can’t figure out problems we haven’t trained them to solve. That means we’re probably still a long way from general A.I. Journalists and social media pundits glossed over the results, and AlphaGo is still lauded as the final frontier in A.I. development. It’s natural for companies to portray their A.I. technology as much more sophisticated than it really is. Doing so attracts new investors and raises consumer confidence. But as A.I. becomes more prevalent, tech companies run into trouble when the humans that support it behind the scenes decide to go public about their work — or when a human translator at a conference notices that things aren’t quite what they seem. Most A.I. companies reveal very little about their algorithms in the name of intellectual property protection. As investors flood into this new field, it’s worth examining any tech company’s claims critically. More than ever, we must use all available information to verify just how artificial and intelligent A.I. truly is. According to Slator, H1 2018 revenues for Appen was AUD 152.8m, of which AUD 131.2m came from the “Content Relevance” division (Appen’s name for their results validation service).